The purpose of this section is to give the investor some context in which to fit all that you are about to say concerning your product and its market. This section should clearly present the business that you are in, the product you will offer, the nature of your industry and the opportunities available to market your product. Present the current status and prospects for the industry in which the proposed business will operate. Discuss any new products or developments, new markets and customers. new requirements, new companies, and any other national or economic trends and factors that could affect the venture's business positively or negatively. Identify the source of all information used to describe industry trends. Describe briefly what business area your company is in, or intends to enter; what products or services it will offer; and who are or will be its principal customers. As background give the date your venture was incorporated and describe the identifi­cation and development of its products and the involvement of the company's principals in that development. If your company has been in business for several years and is seeking expansion financing, review its history and cite its prior sales and profit performance. It' your company has had set-backs or losses in prior years, discuss these and emphasi'/.e what has and will be done to prevent a recurrence of these difficulties and to improve your company's performance. The potential investor will be vitally interested in exactly what you are going to sell, what kind of product protection you have, and the opportunities and possible drawbacks to your product or service. A. Description: Describe in detail the products or services to be sold. Discuss the application of your product or service. Describe the primary end-use as well as any significant secondary applications. Emphasize any unique features of your product or service, and highlight any differences between what is currently on the market and what you will offer that will account for your market penetration. Define the present state of development of the product or service. For products, provide a summary of the functional specifications. Include photographs when available. B. Proprietary Position: Describe any patents, trade secrets or other proprietary features. Discuss any head start that you might have that would enable you to achieve a favored or entrenched position in your industry. C. Potential: Describe any features of your product or service that give It an adv-ama^e over the competition. Discuss any opportunities for the expansion of the product, line or the development of related products or services. Emphasize your opportunities and ex­plain how you will take advantage of them. The purpose of this section of the plan is to present enough facts to convince the investor that your venture's product or service has a substantial market in a growing industry and can achieve sales despite the competition. The discussion and the guide­lines given below should help you do this. This section of the plan is one of the most difficult to prepare and also one of the most important. Almost all subsequent sections of the business plan depend on the sales estimates that are developed in this section. The sales levels you project based on the market research and analysis directly influence the size of the manufacturing operation, the marketing plan, and the amount of debt and equity capital you will require. Yet most entrepreneurs seem to have great difficulty preparing and. presenting market research and analyses that will convince potential investors that the venture's sales estimates are sound and attainable. Because of the importance of market analysis and the dependence of other parts of the plan on the sales projections, we generally advise entrepreneurs to prepare this section of the business plan before they do any other. We also advise entrepreneurs to take enough time to do this section very well and to check alternate sources of market data for key numbers such as "market size" and "market growth rates". A. Customers: Discuss who the customers are for the anticipated application of the product or service. Classify potential customers into relatively homogeneous groups (major market segment) having common, identifiable characteristics. For example, an automotive part might be sold to automotive manufacturers or to parts distributors supplying the replacement market. Who and where are the major purchasers for the product or service in each market segment? What is the basis for their purchase decisions: price, quality, service, per­sonal contacts, political pressures or some combination of these factors? B. Market Size and Trends: What is the total size of the current market for the product or service offered? This market size should be determined from available market data sources and from a knowledge of the purchases of competing products by potential customers in each major market segment. Discussions with potential distributors, dealers, sales representatives and customers can be particularly useful in establishing the market size and trends. Describe the size of the total market in both units and dollars. If you intend to sell regionally, show the regional market size. Indicate the sources of data and methods used to establish current market size. Also state the credentials of people doing market research. trends in the market. Any differences between past and projected annual growth rates should be explained. Indicate the sources of all data and methods used to make projections. C. Competition: Make a realistic assessment of the strengths and weaknesses of competitive products and services and name the companies that supply them. State the data sources used to determine which products are competitive and the strengths of the competition. Compare competing products or services on the basis of price, performance, service, warranties and other pertinent features. A table can be an effective way of presenting these data. Present a short discussion of the current advantages and disadvantages of competing products and services and say why they are not meeting customer needs. Indicate any knowledge of competitors' actions that could lead you to new or improved products and an advantageous position. Review the strengths and weaknesses of the competing companies. Determine and discuss each competitor's share of the market, sales, distribution and production capabilities. Also review the profitability of the competition and their profit trend. Who is the pricing leader; quality leader? Discuss why any companies have entered or dropped out of the market in recent years. Discuss your three or four key competitors and why the customer buys from them. From what you know about their operations, explain why you think you can capture a share of their business. Discuss what makes you think it will be easy or difficult to compete with them. D. Estimated Market Share and Sales: Summarize what it is about your product or service that will make it saleable in the face of current and potential competition. Identify any major customers who are willing to make purchase commitments. Indicate the extent of those commitments and why they were made. Discuss which customers could be major purchasers in future years and why. Based upon your assessment of the advantages of your product or service; the market size and trends; customers; the competition and their products, and the sales trends in prior years; estimate your share of the market, and your sales in units and dollars for each of the next three years. The growth of the company's sales and its estimated market share should be related to the growth of its industry, the customers and the strengths and weaknesses of competitors. This data can be presented in a table, as shown below. The assumptions used to estimate market share and sales should be clearly stated. If yours is an existing business indicate the total market, and your market share and sales for two prior years. E. Ongoing Market Evaluation: Explain how you will evaluate your target markets on a continuing basis to assess customer needs; to guide product improvement and new product programs; to plan for expansions of your production facility; and to guide product/service pricing. The marketing plan describes how the sales projections will be attained. It should detail the overall marketing strategy, sales and service policies, pricing, distribution and advertising strategies that will be used to achieve the estimated market share and sales pr 'ections. It should describe specifically what is to be done, how it will be done. and who will do it. A. Overall Marketing Strategy: Describe the general marketing philosophy and strategy of the company. This should be derived partly from the market research and evaluation. It should include a discussion of: What kinds of customer groups will be targeted for initial intensive selling effort? What customer groups for later selling efforts? How will specific potential customers in these groups be identified and how will they be contacted? What features of the product or service -- e. g. , quality, price, delivery, warranty -- will be emphasized to generate sales? Are there any innovative or unusual marketing concepts that will enhance customer acceptance -- e. g. , leasing where only sales were previously attempted? Indicate whether the product or service will be introduced initially, nationally or on a regional level. If on a regional level, explain why and indicate if and when you plan to extend sales to other sections of the country. Discuss any seasonal trends and what can be done to promote sales out of season. Describe any plans to obtain government contracts to support product development costs and overhead. B. Pricing: Many entrepreneurs have told us that they have a superior product thai they plan to sell for a lower price than their competitors' product. This makes a bad impression for two reasons. First, if their product is as good as they say it la, they must think they are very poor sales people to have to offer it at a lower price than the competition. Second, costs tend to be underestimated. If you start out with low costs and prices, there is little room to maneuver; and price hikes will be tougher to imple­ment than price cuts. The pricing policy is one of the more important decisions you will have to make. The "price must be right" to penetrate the market, maintain a market position and produce profits. Devote ample time to considering a number of pricing strategies and convincingly present the one you select. amortization of development and equipment costs; and price competition. Justify any price increases over competitive items on the basis ol' newness, quality, warranty, and service. If your product is to be priced lower than your competition's, explain how you will do this and maintain profitability -- e. g., greater effectiveness in manufacturing and distributing the product, lower labor costs, lower overhead, or lower material costs. Discuss the relationship of price, market share and profits. For example, a higher price may reduce volume but result in a higher gross profit. Describe any discount allowance for prompt payment of volume purchases. distributors? Can you use manufacturers' sales organizations already selling related products? Describe both the initial plans and longer range plans for a sales force. Discuss the margins to be given to retailers, wholesalers, and salesmen and compare them to those given by your competition. If distributors or sales representatives are to be used, describe how they have been selected, when they will start to represent you and the areas they will cover. Show a table that indicates the build-up of dealers and representatives by month and the expected sales to be made by each dealer. Describe any special policies regarding discounts, exclusive distribution rights, etc. If a direct sales force is to be used, indicate how it will be structured and at what rate it will be built up. If it is to replace a dealer or representative organization, indi­cate when and how. Show the sales expected per salesperson per year, what commission incentive and/or salary they are slated to receive, and compare these figures to the average for your industry. Present as an exhibit a selling schedule and a sales budget that includes all market­ing, promotion and service costs. This sales expense exhibit should also indicate when sales will commence and the lapse between a sale and a delivery. D. Service and Warranty Policies: If your company will offer a product that will require service and warranties, indicate the importance of these to the customers' purchasing decision and discuss your method of handling service problems. Describe the kind and term of any warranties to be offered, whether service will be handled by a company service organization, agencies, dealers and distributors, or factory return. Indicate the proposed charge for service calls and whether service will be a profitable or breakeven operation. Compare your service and warranty policies and practices to those of your principal competitors. E. Advertising and Promotion: Describe the approaches the company will use to bring its product to the attention of prospective purchasers. For OEM and industrial products indicate the plans for trade show participation, trade magazine advertisements, direct mailings, the preparation of product sheets and promotional literature, ^rid the use of advertising agencies. For consumer products indicate what kind of adv': rtising and pro­motional campaign is contemplated to introduce the product and what kind of sales aids will be provided to dealers. The schedule and cost of promotion and advertising should be presented. If advertising will be a significant part of company expenses, an exhibit showing how and when these costs will be incurred should be included. If the product, process or service of the proposed venture requires any design and development before it is ready to be placed on the market, the nature and extent of this work should be fully discussed. The investor will want to know the extent and nature of any desigi and development and the costs and time required to achieve a marketable product. Such design and development might be the engineering work necessary to con­vert a laboratory prototype to a finished product; or the design of special tooling; or the work of an industrial designer to make a product more attractive and saleable; or the identification and organization of manpower, equipment and special techniques to imple­ment a service business -- e.g., the equipment, new computer software and skills required for computerized credit checking. A. Development Status and Tasks: Describe the current status of the product or service and explain what remains to be done to make it marketable. Describe briefly the competence or expertise that your company has or will acquire to complete this develop­ment. Indicate the type and extent of technical assistance that will be required, state who will supervise this activity within your organization and his experience in related development work. B. Difficulties and Risks: Identify any major anticipated design and development problems and approaches to their solution. Discuss their possible effect on the schedule, cost of design and development, and time of market introduction. C. Product Improvement and New Products: In addition to describing the development of the initial products, discuss any on-going design and development work that is planned to keep your product or service competitive and to develop new related products that can be sold to the same group of customers. D. Costs: Present and discuss a design and development budget. The costs should include labor, materials, consulting fees, etc. Design and development costs are often underestimated. This can seriously impact cash flow projections. Accordingly, consider and perhaps show a 10%-20% cost contingency. These cost data will become an integral part of the financial plan. The manufacturing and operations plan should describe the kind of facilities, plant location, space requirements, capital equipment and labor force (part- and full-time) that are required to provide the company's product or service. For a manufacturing business, discuss your policies regarding inventory control, purchasing, production control, and "make or buy decisions" (i. e., which parts of the product will be purchased and which operations will be performed by your work force). A service business may require particular attention and focus on an appropriate location, an ability to minimize overhead, lease the required equipment, and obtain competitive productivity from a highly skilled or a trained labor force. The discussion guidelines given below are general enough to cover both product and service businesses. Only those that are relevant to your venture -- be it product or service -- should be addressed in the business plan. A. Geographic Location: Describe the planned location of the business and discuss any advantages or disadvantages of the site in terms of wage rates, labor unions, labor availability, closeness to customers or suppliers, access to transportation, state and local taxes and laws, utilities and zoning. For a service business, proximity to customers is generally a "must". B. Facilities and Improvements: If yours is an existing business, describe the facili­ties currently used to conduct the company's business. This should include plant and office space; storage and land areas; machinery, special tooling and other capital equip­ment. Discuss how and when plant space and equipment will be expanded to the capacities required for future sales projections. Discuss any plans to improve or add to existing plant space or move the facility. Explain future equipment needs and indicate the timing and cost of such acquisitions. A three year planning period should be used for these projections. C. Strategy and Plans: Describe the manufacturing processes involved in your product's production and any decisions with respect to subcontracting component parts rather than manufacturing in-house. The "make or buy" strategy adopted should consider inventory financing, available labor skills and other non-technical questions as well as purely production, cost, and capability issues. Justify your proposed "make or buy" policy. Discuss any surveys you have completed of potential subcontractors and suppliers, and who these are likely to be. Present a production plan that shows cost-volume information at various sales levels of operation with breakdowns of applicable material, labor, purchased components and factory overhead. Discuss the inventory required at various sales levels. These data will be incorporated into cash flow projections. Explain how any seasonal production loads will be handled without severe dislocation; -- e.g., by building inventory or using part-time help in peak periods. Briefly, describe your approach to quality control, production control, inventory control. Explain what quality control and inspection procedures the company will use to minimize service problems and associated customer dissatisfaction. Discuss how you will organize and operate your purchasing function to ensure that adequate materials are on hand for production, the best price has been obtained, and that raw materials and in-process inventory, and hence, working capital have been minimized. D. Labor Force: Exclusive of management functions (discussed later), does the local labor force have the necessary skills in sufficient quantity and quality (lack of absenteeism, productivity), to manufacture the products or supply the services of your company. If the skills of the labor force are inadequate to the needs of the company, describe the kinds of training that you will use to upgrade their skills. Discuss whether the business can provide training and still offer a competitive product both in the short-term (first year) and longer-term (2-5 years). The management team is the key to turning a good idea into a successful business. Investors look for a committed management team with a balance of technical, managerial and business skills, and experience in doing what is proposed. Accordingly, this section of the business plan will be of primary interest to potential investors and will significantly influence their investment decisions. It should include a description of the key management personnel and their primary duties; the organizational structure; and the board of directors. A. Organization: In a table, present the key management roles in the company and the individual who will fill each position. Discuss any current or past situations where the key management people have worked together that indicate how their skills complement each other and result in an effective management team. If any key individuals will not be on hand at the start of the venture, indicate when they will join the company. In a new business, it may not be possible to fill each executive role with a full-time person without excessively burdening the overhead of the venture. One solution is to use part-time specialists or consultants to perform some functions. If this is your plan, discuss it and indicate who will be used and when they will be replaced by a full-time staff member. If the company is established and of sufficient size, an organization chart can be appended as an exhibit. B. Key Management Personnel: Describe the exact duties and responsibilities of each of the key members of the management team. Include a brief (three or four sentence) statement of the career highlights of each individual that focuses on accomplishments that demonstrate his or her ability to perform the assigned role. Complete resumes for each key management member should be included here or as an exhibit to the business plan. These resumes should stress training, experience and accomplishments of each person in performing functions similar to that person's role in the venture. Accomplishments should be discussed in such concrete terms as profit and sales improvement; labor management; manufacturing or technical achievements; and ability to meet budgets and schedules. Where possible it should be noted who can attest to accomplishments and what recognition or rewards were received -- e.g., pay increases, promotions, etc. C. Management Compensation and Ownership: The likelihood of obtaining financing for a start-up is small when the founding management team is not prepared to accept initial modest salaries. If the founders demand substantial salaries in excess of what they received at their prior employment, the potential investor will conclude that their psychological commitment to the venture is a good deal less than it should be. State the salary that is to be paid to each key person and compare it to the salary received at his/her last independent job. Set forth the stock ownership planned for the key personnel, the amount of their equity investment (if any), and any performance-dependent stock option or bonus plans that are contemplated. D. Board of Directors: Discuss the company's philosophy as to the size and composi­tion of the board. Identify any proposed board members and include a one or two sentence statement of the member's background that shows how he or she can benefit the company. E. Management Assistance and Training Needs; Describe, candidly, the strengths and weaknesses of your management team and Board of Directors. Discuss the kind, extent and timing of any management training that will be required to overcome the weaknesses and obtain effective venture operation. Also discuss the need for technical and management assistance during the first three years of your venture. Be as specific as you can as to the kind, extent and cost of such assistance and how it will be obtained. F. Supporting Professional Services: State the legal (including patent), accounting, advertising and banking organizations that you have selected for your venture. Capable, reputable and well known supporting service organizations can not only provide signifi­cant direct, professional assistance, but can also add to the credibility of your venture. In addition, properly selected professional organizations can help you establish good contacts in the business community, identify potential investors and help you secure financing. A schedule that shows the timing and interrelationship of the major events necessary to launch the venture and realize its objectives is an essential part of a business plan. In addition to being a planning aid and showing deadlines critical to a venture's success, a well-prepared schedule can be an extremely effective sales tool in raising money from potential investors. A well-prepared and realistic schedule demonstrates the ability of the management team to plan for venture growth in a way that recognizes obstacles and minimizes risk. Prepare, as a part of this section, a month-by-month schedule that shows the timing of activities such as product development, market planning, sales programs, and pro­duction and operations. Sufficient detail should be included to show the timing of the primary tasks required to accomplish an activity. The development of a business has risks and problems, and the business plan invar­iably contains some implicit assumptions about them. The discovery of any unstated negative factors by potential investors can undermine the credibility of the venture and endanger its financing. On the other hand, identifying and discussing the risks in your venture demonstrates your skills as a manager and increases your credibility with a venture capital investor. Taking the initiative to identify and discuss risks helps you demonstrate to the investor that you have thought about them. and can handle them. Risks then tend not to loom as large black clouds in the investor's thinking about your venture. This list is not meant to be complete but only indicative of the kinds of risks and assumptions that might be discussed. Indicate which of your assumptions or potential problems are most critical to the success of the venture. Describe your plans for minimizing the impact of unfavorable developments in each risk area on the success of your venture. Discuss in a general way the activities most likely to cause a schedule slippage, and what steps you would take to correct such slippages. Discuss the impact of schedule slippages on the venture's operation, especially its potential viability and capital needs. Keep in mind that the time to do things tends to be underestimated -- even more than financing requirements. So be realistic about your schedule. The proposed venture should be an instrument of community and human development as well as economic development, and it should be responsive to the expressed desires of the community. Describe and discuss the potential economic and non-economic benefits to members of the community that could result from your venture. Describe any compromises or time lags in venture profilability thut may result t'rom trying to achieve some or all of the kinds of benefits cited above. Any riuch coii-tprornideri or lags in profitability should be justified in the context of all the benefits achieved and the role of the venture in a total, planned program of economic, human and community development. The financial plan is basic to the evaluation of an investment opportunity and should represent the entrepreneur's best estimates of future operations. Its purpose is to indicate the venture's potential and the timetable for financial viability. It can also serve as an operating plan for financial management of the venture. In the case of an existing venture seeking expansion capital, balance sheets and in­come statements for the current and two prior years should be presented in addition to these financial projections. Sample forms for preparing financial projections have been provided as Exhibits 1-3 ^ . It is recommended that the venture's financial and marketing personnel prepare them, with assistance from an accountant if required. In addition to these three basic financial exhibits, a break even chart (Exhibit 4) should be presented that shows the level of sales required to cover all operating costs. After you have completed the preparation of the financial exhibits, briefly highlight in writing the important conclusions that can be drawn. This might include the maximum cash requirement, the amount to be supplied by equity and debt; the level of profits as a percent of sales; how fast any debts are repaid; etc. The preparation of pro forma income statements is the profit planning part of financial management. Crucial to the earnings forecasts --as well as other projections -is the sales forecast. You have already developed sales forecasts while completing your Market Research and Analysis section. The sales data projected should be used here. Once the sales forecasts are in hand, production costs (or operations costs for a service business) should be budgeted. The level of production or operation that is required to meet the sales forecasts and also to fulfill inventory requirements must be determined. The material, labor, service and manufacturing overhead requirements must be developed and translated into costdata. A separation of the fixed and variable elements of these costs is desirable, and the effect of sales volume on inventory, equip­ment acquisitions and manufacturing costs should be taken into account. Sales expense should include the costs of selling the distribution, storage, discounts, advertising and promotion. General and administrative expense should include manage­ment salaries, secretarial costs, and legal and accounting expenses. Manufacturing or operations overhead includes rent, utilities, fringe benefits, telephone, etc. 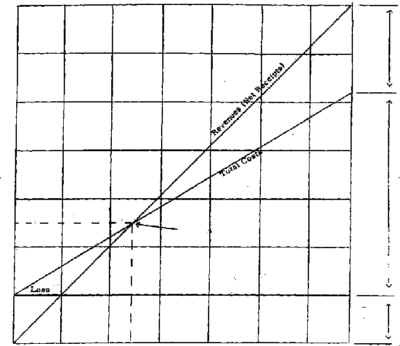 Charles G. Zimmerman, "Projection of Financial Statements -- And the Preparatory Use of Work Sheet Schedules for Budgets" and RMA Form C-117, "Projection of Financial Statements", (Philadelphia. Pennsylvania: Robert Morris Associates, 1961). Earnings projections should be prepared monthly in the first year of operation and quarterly for the second and third years. If these earnings projections are to be useful they must represent management's realistic, best estimates of probable operating results. Sales or operating cost projections that are either too conservative or too optimistic have little value as aids to policy formu­lation and decision-making. Discussion of Assumptions: Because of the importance of profit and loss projections as an indication of the potential financial feasibility of a new venture to potential investors, it is extremely important that any assumptions made in its preparation be fully explained and documented. Such assumptions could include the amount allowed for bad debts and discounts, and any assumptions made with respect to sales expenses or general and administrative costs which are fixed percentages of costs or sales. Risks and Sensitivity: Once the income statements have been prepared, draw on Section 8 of these guidelines to highlight any major risks that could prevent the venture's sales and profit goals from being attained, and the sensitivity of profits to these risks. This discussion should reflect the entrepreneur's thinking about the risks that might be encountered in the firm itself, the industry, and the environment. This could include such things as the effect of a 20% reduction in sales projections, or the impact over time of- a learning curve on the level of productivity. For a new venture the cash flows forecast can be more important than the forecasts of profits because it details the amount and timing of expected cash inflows and outflows. Usually the level of profits, particularly during the start-up years of a venture, will not be sufficient to finance operating asset needs. Moreover, cash inflows do not match the outflows on a short-term basis. The cash flows forecast will indicate these conditions and allow management to plan cash needs. Given a level of projected sales and capital expenditures over a specific period, the cash forecast will highlight the need for and timing of additional financing and indicate peak requirements for working capital. Management must decide how this additional financing is to be obtained, on what terms, and how it is to be repaid. Part of the needed financing will be supplied by the equity financing (that is sought by this business plan) part by bank loans for one to five years, and the balance by short-term lines of credit from banks. This information becomes part of the final cash flows forecast. If the venture is in a seasonal or cyclical industry, or is in an industry in which suppliers require a new firm to pay cash, or if an inventory build-up occurs before the product can be sold and produce revenues, the cash flows forecast is crucial to the con­tinuing solvency of the business. A detailed cash flows forecast which is understood and used by management can help them direct their attention to operating problems without distractions caused by periodic cash crises that should have been anticipated. Cash flows projections should be made for each month of the first year of operation and quarterly for the second and third years. Discussion of Assumptions: This should include assumptions made about the timing of collections receivables, . trade discounts given, terms of payments to vendors, planned salary and wage increases, anticipated increases in any operating expenses, seasonality of the business as it affects inventory requirements, inventory turnovers per year, and capital equipment purchases. Thinking about such assumptions when planning your venture is useful for identifying issues which may later require attention if they are not to become significant problems. Cash Flow Sensitivity: Once the cash flow has been completed, discuss the impact on cash needs that possible changes in some of the crucial assumptions would have; e. g. . slower receivables collection or sales below forecasts. This will enable you to test the sensitivity of the cash budget based on differing assumptions about business factors, and to view several possible outcomes. Investors are vitally interested in this because it helps them estimate the possibility that you will need more cash sooner than planned. The balance sheets detail the assets required to support the projected level of operations and show how these assets are to be financed (liabilities and equity). Investors and bankers look at the projected balance sheets to determine if debt to equity ratios, working capital, current ratios, inventory turnover, etc. , are within the acceptable limits required to justify future financings projected for the venture. Pro forma balance sheets should be prepared at start-up, semi-annually for the first year, and at the end of each of the first three years of operation. A breakeven chart shows the level of sales (and hence, production) needed to cover all your costs. This includes those costs that vary with the production level (manufacturing labor, material, sales costs) and those that do not change with produc­tion (rent, interest charges, executive salaries, etc. ). The sales level that exactly equals all costs is the breakeven level for your venture. It is very useful for the investor and the management to know what the breakeven point is and whether it will be easy or difficult to attain. It is very desirable Cor your projected sales to be sufficiently larger than the breakeven sales so that small changes in your performance do not produce losses. You should prepare a breakeven chart and discuss how your breakeven point might be lowered in case you start to fall short of your sales projections. You should also discuss the effect on your breakeven point of lower production capacity requirements. Your ability to meet your income and cash flows projections will depend on your ability to monitor and control costs. For this reason many investors like to know what type of accounting and cost control system you have or will use in your business. Accord­ingly, the financial plan should include a brief description of how you will obtain and report costs, who will be responsible for controlling various cost elements, how often he or she will obtain cost data, and how you will take action on budget overruns. The purpose of this section of the plan is to indicate the amount of money that is being sought, the nature and amount of the securities offered to the investor, and a brief description of the uses that will be made of the capital raised. The discussion and guide­lines given below should help you do this. You should realize that the financing terms you propose here are the first step in a negotiation process with a venture capital investor who is interested in your "deal". It is very possible that when you close your financing, you will be selling a different kind of security (e.g., convertible debt instead of common stock) for a different price than you originally proposed. B. Securities Offering: Describe the kind (common stock, convertible debenture, etc. ), unit price, and total amount of securities to be sold in this offering. For securities other than common stock (e. g. . debt with warrants, debt plus stock) indicate interest, maturity, and conversion conditions. Also show the percentage of the company that the investors of this offering will hold after it is completed, or after exercise of any stock conversion or purchase rights in the case of convertible debentures or warrants. "The shares being sold pursuant to this offering are restricted securities and may not be resold readily. The prospective investor should recognize that such securities might be restricted as to resale for an indefinite period of time. Each purchaser will be required to execute a Non-Distribution Agreement satisfactory in form to corporate counsel." C. Capitalization: Present in tabular form the current and proposed (post-offering) number of outstanding shares of common stock. Indicate any shares offered by key management people and show the number of shares that they will hold after completion of the proposed financing. capital equipment; marketing; and general working capital needs.